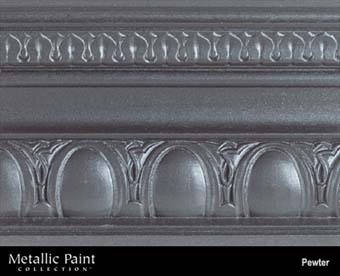 DiscountPaint.net :: DECORATIVE PAINTS :: METALLIC PAINT-MODERN MASTERS :: MODERN MASTERS METALLIC PAINT 20906 ME-209 PEWTER NT SIZE:6 OZ. MODERN MASTERS METALLIC PAINT 20906 ME-209 PEWTER NT SIZE:6 OZ. ALLWAY K700 18MM SNAP OFF KNIFE PACK:10 PCS. HYDE 45005 PAINT SHEILD SIZE:15"
CUSTOM PAINT COLOR MATCHING INTERIOR METALLIC PAINT WATER BASE SIZE:5 GALLONS. WHIZZ 99000 WHITE & YELLOW STRIPE ACRYLIC ROLLER CLAMSHELL SIZE:4" PACK:10 PCS. GARDNER GIBSON 6245-GA ALUMA-KOTE FIBERED ALUMINUM ROOF COATING SIZE:5 GALLONS. 3M CP-040NA FINE ANGLED SANDING SPONGE PACK:24 PCS.